"One sees the old priest writing it into the wall of the temple. He only knows some standard phrases and his name. It becomes complicated and therefore he switches to the script he knows more fluently - Demotic*." Because of this interest, I decided to make a picture of the inscription which could clearly show hieroglyphs and their arrangement. 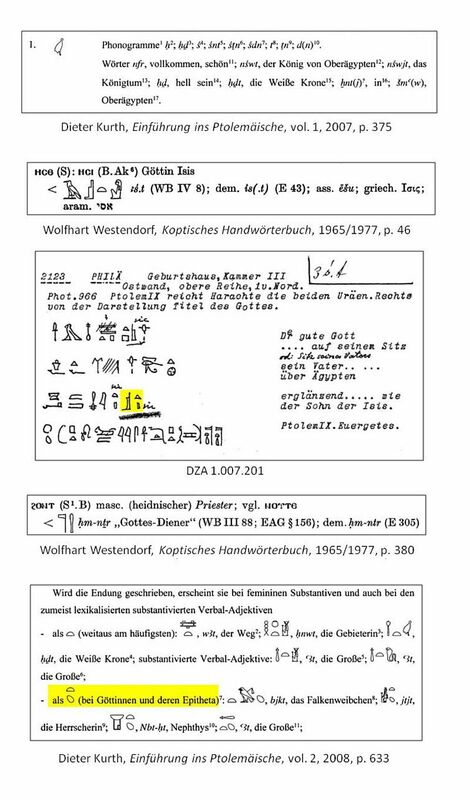 I corrected some hieroglyphs, transcription, and translation which I think it should be instead of original from Catalogue of the Demotic Graffiti of the Dodecaschoenus, vol. I: Text, Oxford, 1935, p. 126 by F. Ll. Griffith, which I used as a basis for my work. What do you think about this inscription? How it makes you feel? Do you think that my translation, transcription, and choice of hieroglyphs are correct? What you should change? Do you think that my translation, transcription, and choice of hieroglyphs are correct? What you should change? I would like to stick to the reading and interpetation of: F. Ll. Griffith, Catalogue of the Demotic Graffiti of the Dodecaschoenus, vol. I (Text), Oxford, 1937, p. 126. Please note his remark: "The name and titles of the author would be unintelligible without the key given by the demotic." There are several readings of the White Crown H1 in the Ptolemaic time, but not one which could be related to Esmet or similar. G7D (for G7; falcon of Horus on a standard) is an abbreviation of nb "lord" (Wb. II, 227 and DZA 24.374.30). The following sign is not V30 nb, but N102 or N18 jw "island" which was erroneously used for N30 jA.t "mound" (Wb. I, 26), jA.t-wab.t "Abaton, the island Bigge near Philae", literal: the "pure mound". Thank you for contacting Michael for this, and thank him for answering on it. 1) I suspected that there is a different readings for White Crown during Ptolemaic times, but I couldn't find any document which list those. Do you have source where I can find other transliterations for White Crown? I am also thinking, because the hieroglyphs in very bad shape, could this be some other hieroglyphs instead of White Crown (S1), which would fit in the name of Esmet-Akhom? 2) Why translation of Q1-X1:Q3-V20:Z1 (jst-mD) is translated Esmet? I guess again that this hieroglyphs has some other value in Ptolemaic times, and if that is true, do you have any source text where I can find those? 3) For word "second", could be that the instead of H8 (egg) hieroglyphs it is actually W24? Also for this word, I think that right transliteration would be actually 2-nwt because it has t inside it and also it could be feminine if we treat preceding word as feminine (Hmt). 4) Is the G7D right hieroglyph in this situation? For N102 or N18, if we look original inscriptions it doesn't look like any of these two, more like V30 with some weird line in the middle, but you got the point with that translation of word Abaton. I could not find the right hieroglyphic writing of name of this place until now. See examles from TLA for N102! Thank you Aset for these references. I hope I will get answers to my questions from Michael Tilgner. ... I hope I will get answers to my questions from Michael Tilgner. Do you have source where I can find other transliterations for White Crown? I add the entry for S1: The first line lists the phonograms, the following lines the ideograms (words). As you can see from it, reading Ptolemaic texts is a difficult and - above all - time-consuming task! Therefore there are only few egyptologists around who have specialized in this field. could this be some other hieroglyphs instead of White Crown (S1), which would fit in the name of Esmet-Akhom? Looking again at the hieroglyphs of Phil 436 I think that at least this sign is clearly identifiable. I point again to Griffith's comment that the name and title can only be read by resorting to the Demotic. Why translation of Q1-X1:Q3-V20:Z1 (jst-mD) is translated Esmet? (2) The final t of As.t / js.t has fallen off in later times, as can be seen from the Coptic form "ise". Whether the sign below X1 is really Q3, must be open. Perhaps it is only a Z1 (my opinion), compare it with the Z1 under V20 (see a similar writing also from Philae: DZA 1.007.201). Could this mean that Esmet-Akhom is actually a woman? (3) Not at all! Griffith refers to the Coptic word hont which is the equivalent of Hm-nTr "priest (servant of god)". The final nt is the rest of nTr "god"; this word alone is noute in Coptic, the final r has fallen off. Griffith obviously thinks that the spelling of the time has crept into the hieroglyphic writing, thus creating the feminine form Hm.t-nTr, which is indeed "remarkable". could be that the instead of H8 (egg) hieroglyphs it is actually W24? (3') The sign looks quite similar to the signs a line above and a line below. The group X1:H8 is used in Ptolemaic texts as an ending for goddesses and their epithets. As Esmet-Akhom wrote his title in a feminine form, he also applied the feminine form for 2-nw "second"; at least this seems logical! One can try to find out the reasons why Esmet-Akhom wrote his text as he did, but not all can be clarified. Thank you Lutz, and thank you, Michael, for giving this great explanation with a lot of the references. I will use the information you provided to correct my drawing. Here is corrected version of the Graffito. I think, D37 / D38 / D39 is correct, not D39. Wb 2, 45.10, no evidences for D40. I agree with you, but if you look at original inscription, you will see that arm is holding a stick, so this is probably the priest's mistake. So I left it as in original. J.H.F. Dijkstra : [url=https://***.nl/research/portal/publications/religious-encounters-on-the-southern-egyptian-frontier-in-late-antiquity-ad-298642(93685692-6079-4d6e-8d19-1d6a177ca3a1).html]Religious Encounters on the Southern Egyptian Frontier in Late Antiquity (AD 298-642)[/url]. - [University of Groningen, PhD, 2005]. - PDF - 3 MB - 247 p.
Solange Ashby : Calling Out to Isis - The Enduring Nubian Presence at Philae. - [University of Chicago, PhD, 2016]. - PDF - 6 MB - 316 p.
The PDF's are searchable. So you can quickly find the relevant sections with keyword "Esmet". For the first link : copy and past it into your browser and replace "***" with "rug". Thank you very much Lutz, I will check those links and PDFs.